I really like how these delicious Raspberry Oatmeal Squares combine an oatmeal cookie with ruby red raspberry jam (preserves). They have a wonderful buttery oatmeal flavor and a soft and chewy texture. Try to use a good quality jam (preserve) as it will keep its bright red color even after baking. 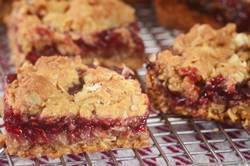 These Raspberry Oatmeal Squares really do benefit from sitting overnight, as this allows them to soften and their flavors to mingle. Perfect with your morning cup of coffee or to tuck into lunchboxes. For those who would like to make their own homemade raspberry jam, I have included a recipe here. It is so easy to make and the flavor of homemade jam is superior to store bought and is less expensive. I recommend making the jam at least a couple of days before you plan to make these squares. To make the raspberry jam: Place 2 cups (225 grams) (8 ounces) frozen unsweetened raspberries and 1/4 cup (50 grams) granulated white sugar in a small saucepan and bring to a boil over medium heat. Reduce the heat and simmer, stirring occasionally, for about 20 - 25 minutes or until most of the liquid has evaporated. Do not let it burn. Remove from heat and pour into a heatproof measuring cup. You should have about 1 cup of preserves. Stir in a drop or two of lemon juice. Cover and place in the refrigerator. Raspberry Oatmeal Squares: Preheat oven to 350 degrees F (177 degrees C) and place rack in center of oven. Butter (or use a non stick cooking spray) a 9 x 9 inch (23 x 23 cm) pan. Oatmeal Base: In the bowl of your electric mixer (or with a hand mixer), beat the butter and sugar until light and fluffy (about 2 minutes). Add the egg and vanilla extract and beat until incorporated. In a separate bowl whisk together the flour, baking soda, and salt. Add to the butter mixture and mix until well combined. Stir in 1 3/4 cups (155 grams) of the rolled oats. Press 2/3 of the dough into the bottom of the prepared pan. Spread the raspberry jam (preserves) over the oatmeal base. To the remaining dough add the remaining 1/4 cup (25 grams) of rolled oats. Crumble this mixture evenly over the top of the raspberry jam. Bake for about 25 - 30 minutes or until nicely browned. Place on a wire rack to cool and then cut into squares. Makes about 16 - 2 inch squares. These are best if made the day before serving. Store leftovers in the refrigerator.